SAVE $20, now $129.95 for a limited time with FREE Priority Mail shipping in the USA and free First Class Mail shipping outside the USA. Automatically recalls your preferences for the the Automatic Engine Stop Start disable feature (and the 'SPORT' button on '16-'18 GC and Durango models only) each time you start the car. NEW!! '18 Jeep Wrangler JL. 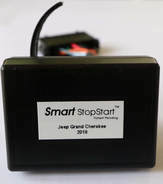 The Wrangler JL SmartStopStart module easily plugs into two connectors under dashboard in about 5 minutes. The SmartStopStart DOES NOT disable the Security Gateway Module or require the OBDII port like 'programmer' type products do. '18 - '19 NEW!! Jeep Grand Cherokee Laredo, Upland or Altitude and Dodge Durango SXT or SXT Plus owners please click HERE for more information. '19​ Jeep Cherokee (Limited, Overland and Trailhawk Elite ONLY) plugs in under the driver's seat in about a minute.​ (We do not have a '19 Cherokee Latitude, Latitude Plus or Trailhawk model at this time). ​NEW!! '18 Chrysler Pacifica (all models with USB ports in 3rd row, typically Touring L,Touring L Plus, and Limited ONLY). We do not support the L, LX and Touring Plus at this time). Please review installation instructions HERE prior to ordering. All '16-'17 models (Jeep Grand Cherokee, Dodge Durango and Chrysler Pacifica) and '15-'18 Jeep Cherokee models plug into the diagnostic port under the dashboard in about 15 seconds. -No fault messages, fault codes, fault display, or fault beeps. -Fully compatible with Remote Start with NO restrictions. -The driver, if he or she wishes, can turn the ESS feature back on at the press of a button. -Minimum size for maximum stealth. ​-RISK FREE 90-day money-back satisfaction guarantee. 3-year free repair/replacement warranty. -Designed in the USA specifically for your make and model with quality automotive grade components. ​-In stock for immediate delivery. 2018 Jeep Wrangler JL SmartStopStart plugs in under dashboard. This item cannot be used on California registered vehicles. We will not try to sell you anything, and we will not put you on a mailing list. ​We will just answer your question. ​Have an Export Diesel Model? Contact us for the latest compatibility information. Play the video above and see Smart StopStart in action!